We Want Your Feed Back and Ideas! 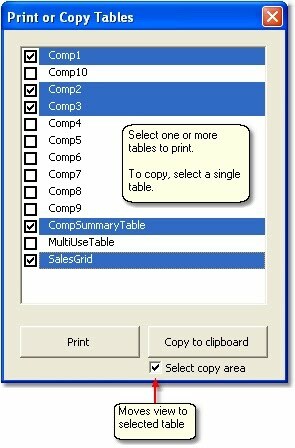 Right-click and select Print or Copy Tables, then select the tables to print or copy. Excel will first display the selected tables in Print Preview mode. For copy operations, select a single table. Tip: Help pages can be printed (link at bottom), but hey, we're all going green, so please think twice before printing. FYI: Screen shots and videos in the this document are a mix of Excel 2000-2003 and 2007.